What’s this? Apparently you hardly imagine the gadget is an iPhone stand if you just see it alone. But it’s true, it’s not a mini toilet plunger.Undoubtedly the iPhone stand comes with all features of plunger: red rubber suction cup, wooden stick handle. Of course, the rubber suction cup is ready for your iPhone, iPod, or any device with a smooth hard back. Just attach the plunger-shaped stand to the iPhone back cover, let your iPhone stand. 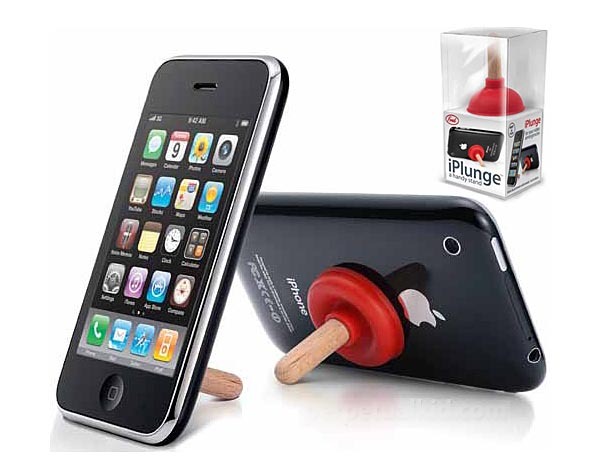 iPLUNGE plunger-shaped iPhone stand is priced $5.99 USD. If you want to own the fun gadget, jump to perpetual kid for more details.